According to my quick research Gloam comes to us from Santa Cruz, CA, normally a sunny welcoming place. It is with certainty I can say Gloam are not using their geographic origin as inspiration for their music. Their EP Death is the Beginning adds doomy viewpoint to black metal, and cheery is not an outlook you will achieve after listening to these punch packing 20 min. Mournful epic rolls announce the arrival of Anguish, and crescendos keep on growing, distorted guitars with an interesting reverb declare the end of the world, desperate hopeless melodies over brooding bass. Two and a half minutes in, Anguish makes one final mad tremolo double bass supported rush to the end, and the composition keeps you in suspense whether escape was successful. … of Carrion Kind and the title track make up the full and vocalized songs on the EP. Tremolo chord progressions of … of Carrion Kind veer off the straight path and are comparable to some mid-paced Swedish black metal of Necrophbic or Lord Belial. … of Carrion Kind rushes to blasting only at times. In Gloam's world hell is this interesting place of epic proportions rather than a disgusting pit. Gloam's take on it is much more grief than dirt. Vomitous vocals betray degree of suffering as well, and layers of mournful classical influenced melodies complete … of Carrion Kind in the end. On the title track Gloam opens up with twangy emptiness, and then proceeds to abandon all dynamism and pace, everything growing into one doomy stretch. It isn't until more than half way through melodic blasting and layered guitars bring on the final drama. 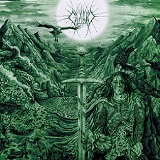 Mostly black metal, but touching on doomy melodicism, Gloam has very interesting guitar sound that allows them to draw the pictures they need vividly. Distorted, yet surprisingly clean and legible, the EP will not be a turn off for either those preferring their music raw or much less lo-fi.